Now that Lake Delton has been restored, businesses in Wisconsin Dells are hoping for a good start to the vacation season. With the Memorial Day weekend approaching, Romy Snyder of the Wisconsin Dells Visitor and Convention Bureau says they&apos;re looking forward to the return of tourists this summer. She says resorts are already seeing reservations pick up and the Tommy Bartlett Ski Show will be back on the lake Friday night. Flooding last June caused Lake Delton to breach its banks and drain, leaving many resorts and businesses with few customers for the summer. Snyder says they&apos;re excited the lake could be restored so quickly, and thanks the governor and other state officials for working so hard to make it happen. With many families looking for cheaper summer vacation options, Snyder says the Dells could see plenty of visitors this year. She says the central location and affordable options mean there&apos;s plenty for families to do. 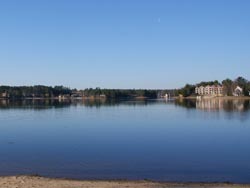 Officials will hold an official rededication ceremony for Lake Delton on June 9th, the one year anniversary of the flood.